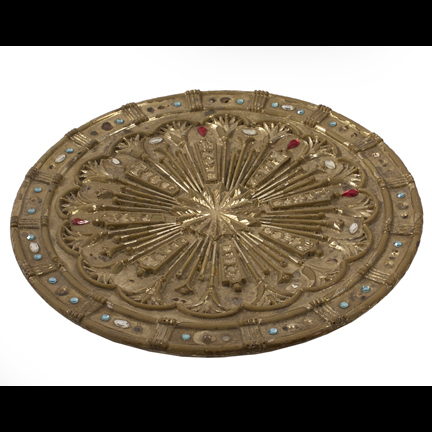 This Egyptian style prop dining plate was used in the 1963 epic motion picture, "Cleopatra," starring Elizabeth Taylor and Richard Burton. 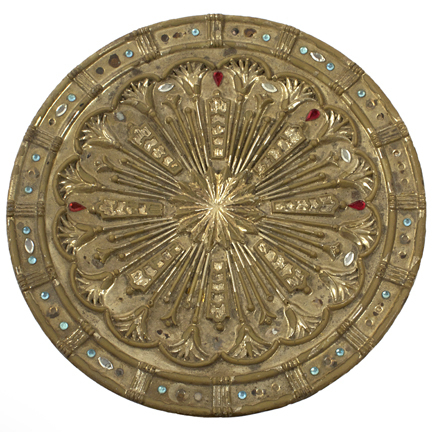 The plate was one of a limited number that were custom cast for use on the production. 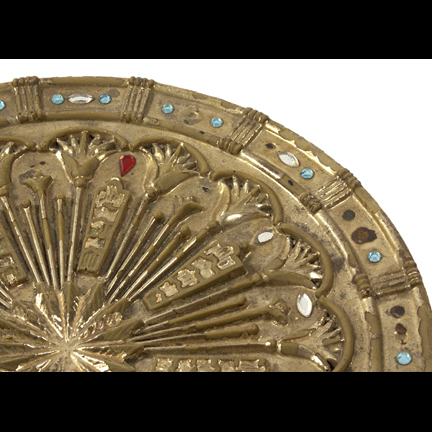 The plate is constructed of fiberglass with gold metallic leaf on the exterior and hand applied faux gemstones of assorted colors. 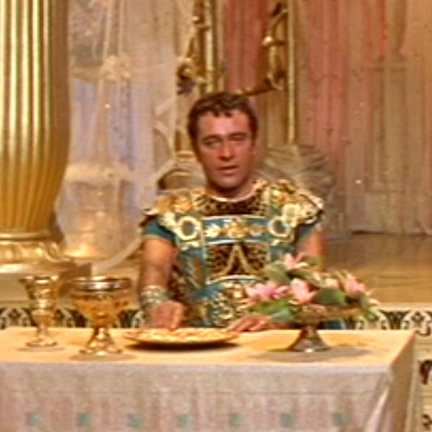 The plate was one of several seen on the dining tables in Cleopatra's royal barge during the scene when she throws a magnificent feast in Tarsus for Caesar's general Marc Antony (Richard Burton). 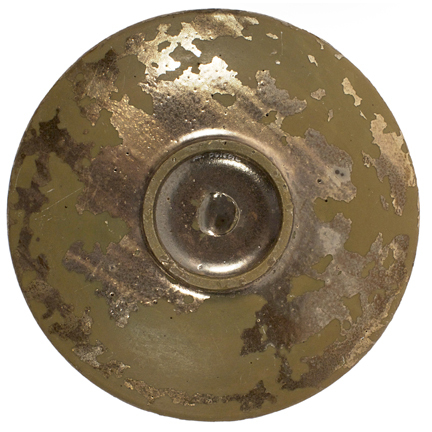 A "Hero" version of this plate can be seen in front of Ms. Taylor in the cover article pictorial of the April 13, 1962 issue of Life Magazine. 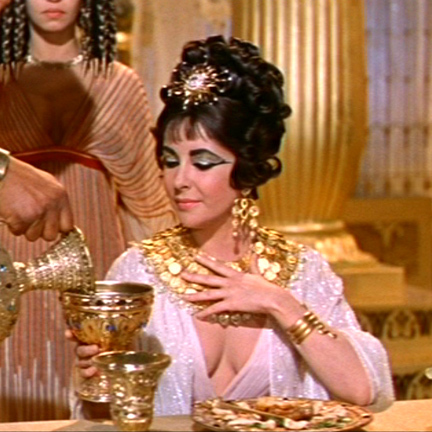 "Cleopatra" was the most expensive movie ever made at its time and nearly bankrupted 20th Century Fox after filming had concluded. 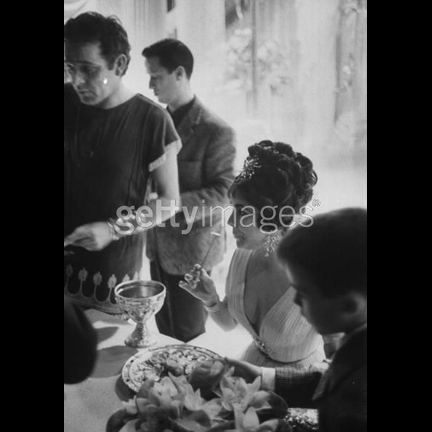 This was largely due to difficulties and budget overruns caused by the film's star, Elizabeth Taylor. The actress was awarded a record-breaking one million dollar contract, which eventually swelled to seven million due to delays in production. Additional delays were caused by an illness Ms. Taylor suffered which later required the production to completely relocate. The film suffered further scandal when the married Taylor and Burton embarked on a very public affair during the production, causing widespread moral outrage among the general public. 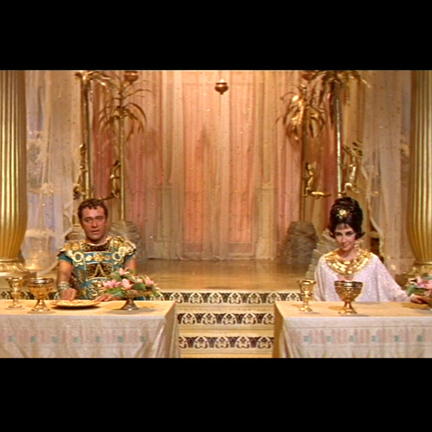 Despite its controversy, critics praised "Cleopatra," and the film received four Academy Awards in 1964, including Best Special Visual Effects, Best Costume Design (Color), Best Cinematography (Color), and Best Art Direction-Set Decoration (Color). 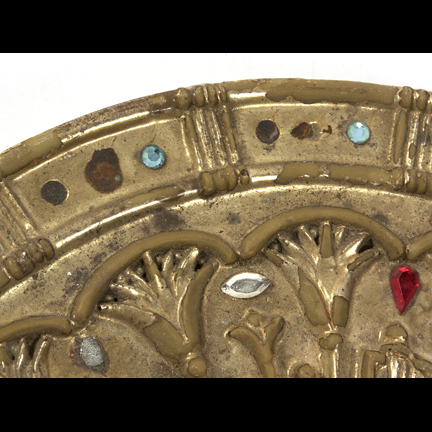 The prop plate is in fair screen used condition with some loss of gold leaf and missing faux gemstones due to age and re-use on other productions. Accompanied by a letter of authenticity. Presented by The Golden Closet, your premier source for iconic screen used wardrobe, props, and music entertainment memorabilia.